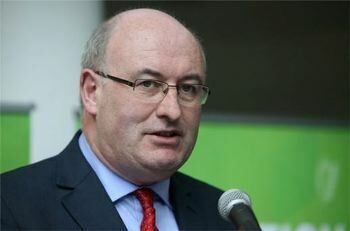 The following letter from Minister Phil Hogan to the Editor and published in the Irish Times on May 23rd 2014 strongly rejects the findings of a previous article “Dramatic fall in number of buildings being started” by Frank McDonald on Monday (19th May 2014 – click link here). The Minister takes issue with some of the statistics for commencement notices noted by Mr McDonald. 2013 commencement notice numbers come from a presentation made by Bernadette McArdle at the Institute of Building Control in Ireland (IBCI) Conference in April 2014. The total number of commencement notices (for all building types) lodged nationwide for 2013 was 7,456, or an average of 143 per week (620 per month) not 100 per week as suggested by the Minister. Senior Department figures were in attendance at this conference. A PDF of the IBCI Conference presentation downloaded from the IBCI website is attached. The Local Government Management Agency (LGMA) have reported that a total of 327 commencement notices (including 7-day notices) were validated for March and April. This figure is the total for the whole of Ireland and includes all buildings types. This averages around 164 per month. The figures quoted in the Minister’s letter suggest advisors have unwittingly counted all the test sample applications that many users entered to find out what questions they are asked on the new system. There may be some confusion as many registered professionals have noted that once you start tinkering around with the BCMS it will register even if you never complete the submission. In other words, trial runs by professionals of the BCMS system may result in “false positives”. A PDF of the document downloaded from the LGMA website is attached. Only 180 individual professionals have submitted commencement notices as Assigned Certifiers, not the 2000 as implied by the Minister in his letter. Setting up a User Account is quite a different process to actually lodging a Commencement Notice. Many contributors to the blog here have set up a User Account as a test but do not intend to take on the role of assigned certifier. The BCMS system has a number of “teething issues”. One in particular would be the inability to lodge completion documentation. We will be looking at these in more detail. Previous posts as to technical problems such as lack of password protection, verification of information and illegal commencement notice formats are included at the bottom of this post. Issues associated with the current difficulties of self-building have been posted upon in this blog and elsewhere: we suggest a visit to the representative body for self-builders (IAOSB) for up-to-date information (website link: http://www.iaosb.com/). The IAOSB have requested clarification on the issue from the Attorney General (See link here) and have also requested an independent inquiry into statements made by Minister Hogan in the Seanad. Sir, – I strongly reject the assertions in the article by Frank McDonald suggesting that recent amendments to the building control regulations are leading to a decline in building activity. The only source used appears to be an online blog with a clear vested interest to discredit the new regulations (“Dramatic fall in number of buildings being started”, Home News, May 19th). There has been no attempt to provide balance or at the very least check the accuracy of the assertions of the blog. The article is disingenuous with respect to the decline in the construction sector, inferring that the new regulations have further contributed to that decline. The fact is, as noted in the Construction 2020 Strategy published last week, commencement notices have been falling year on year from about 1,450 per week at the peak of the building boom in 2006 to about 100 per week last year. Around 840 commencement notices have been validated or are at various stages of lodgement in the 10 weeks since the new regulations were introduced. That is about 80 notices per week, which does not constitute a dramatic fall in building starts. Claims that architects, surveyors and chartered engineers are reluctant to take on the assigned certifier role are completely unsubstantiated. The fact is that over 2,000 registered construction professionals have set up user accounts on the Building Control Management System (BCMS) to date. And the BCMS, far from creating an avalanche of paperwork, has streamlined the administration involved, providing local authorities with easy access to the information they need. Indeed, I am aware that building control staff are already using the BCMS to intervene in a number of projects currently under way in relation to compliance matters that may previously have gone unnoticed. Furthermore, the new regulations do not prevent self-build or building by direct labour. They do not require the appointment of a main contractor. Self-build projects are known to have been lodged on the BCMS, so the new regulations are clearly workable in such scenarios. I signed up to the BCMS whilst attending a talk on SI9. As I have been blocked from registering as an architect I can’t actually use the system anyway. Not only is SI9 unworkable, so is the building control bill 2007 which “de-architected” me. Thanks for the clarity regarding the actual SI9 statistics. It seems to me that Minister Hogan should really do his homework in future before throwing out his interpretation of ‘facts’.. I am another in the list of those who have set up a User Account as a test but it is very uncertain at the moment as to whether I will undertake the role of assigned certifier.